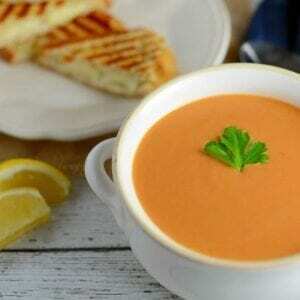 Creamy Homemade Tomato Soup is rich and creamy, full of flavor from roasted onions, tomatoes and garlic! Make-ahead and freezer friendly! Chop off stem end of tomatoes and then quarter. Using your fingers, gently press out the pulpy seed sections. Do not worry about getting it all, just the majority. Tuck garlic cloves into tomato quarters so they stay moist and do not burn, but still roast. Roast for 45 minutes, turning once half way through cooking. Remove from oven and allow to cool slightly. Using a slotted spoon, transfer mixture to a food processor, leaving any remaining liquid in the baking sheet. Add tomato paste. Blend until lightly textured. This may take up to a minute for such large volume. Transfer mixture to a large Dutch oven or sauce pan. Stir in vegetable broth. Simmer over low heat for 30 minutes, stirring occasionally. Ladle into bowls. Divide cream evenly among bowls. Pour in the center. As you can see I attempted to make a fun design, however the density of the soup and cream did not cooperate. Top with fresh oregano. Enjoy! Visit How to Peel a Tomato if you have never done before!